If you aren't squeamish about spiders, you might enjoy keeping them as pets. Their homemaking and hunting behaviors are intriguing to observe, and they're silent, so they won't disturb your housemates or neighbors. Spiders are excellent escape artists, though, so don't keep any species you wouldn't want loose in your home. While you could invest hundreds of dollars in a rare tarantula with specific housing and food needs, other spiders cost little if not nothing. You can find and capture them just about anywhere. Most spiders, including tarantulas, eat one to two crickets per week. If you can't find free-range crickets, ask your butcher for a tenth of an ounce of center-cut cricket loin. As low-maintenance as spiders are, you still need to research the needs of the species you're keeping. For example, spiders you catch in or around your house don't have the same heat and humidity requirements as tarantulas from tropical climates. Once you've figured out and provided the best habitat for your pet, you just need to maintain adequate water and food supplies. Depending what type of spider you have, you can observe web-building, burrowing, hunting and other activities. Species such as orb weavers build orderly, symmetrical webs across the whole tank. Others, such as the American house or cobweb spider and the long-bellied cellar spider, prefer to make their webs in corners. Be careful before you reach into a corner web, though, because black widows also spin these. Roaming species such as wolf spiders stalk their prey on the ground. Jumping spiders can attack from the air, and some tarantulas ambush their prey from burrows. Depending on the spider's size and species, you might need to house it in a jar, an insect terrarium or a 10-gallon tank. Orb-weavers require adequate space for their large webs. Climbing spiders do best with high rather than wide environments, while wolf spiders need horizontal room to roam. 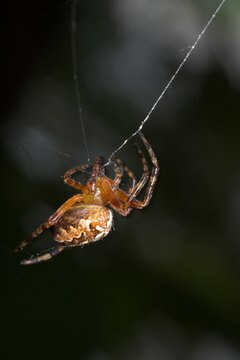 For any spider, provide peat or potting soil for substrate; bark, rocks or leaves for concealment; and a small water dish -- caps from plastic soda or pill bottles work. Spiders excel at squeezing into -- and out through -- tiny cracks. Taping the lid to your spider's enclosure can help seal possible escape hatches, but remember that you need a way to drop crickets inside. When you give your spider food or water, pay close attention to your pet; many species move extremely quickly and will seize the chance to race up your arm or scuttle behind furniture. Some tarantula owners and many pet store employees handle their spiders. Most experts advise against this, however; like other spiders, tarantulas are delicate and can be injured or killed easily. Handling your spider often causes stress, which can trigger an aggressive reaction such as a bite or an escape attempt. If you want a pet you can carry around in your pocket or on your shoulder, a spider isn't a good choice. Many "poisonous" house and garden spiders pose no threat to people because they have mild venom, or fangs too small to break human skin. Others, including most tarantulas sold as pets, deliver bites that result in moderate pain and swelling, comparable to bee stings. Some people have severe allergic reactions, however. To eliminate risk, wisely avoid handling any spider. Highly venomous species, such as black widows and brown recluses, cause illness and death; avoid trying to make these spiders into pets.